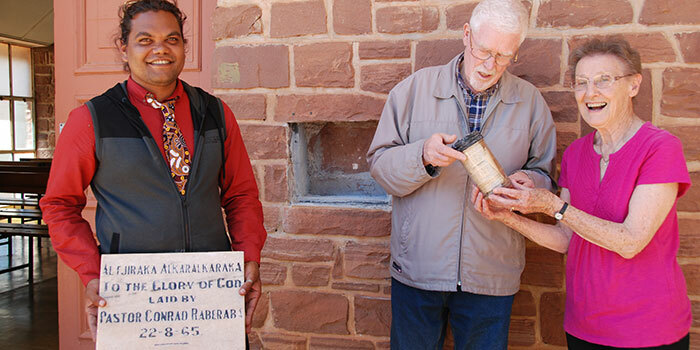 A little more than 50 years ago, when Pastor Conrad Raberaba set in place the foundation stone of the new church at Hermannsburg, 125 kilometres west of Alice Springs, a time capsule prepared by congregation members Olga Radke and Karl Benz was placed behind it. On 25 September 2016, on the occasion of Bethlehem Lutheran Church’s 50th anniversary, Olga and Karl were there to watch the stone being carefully removed and the capsule being held aloft by 26-year-old Nicholas Williams. 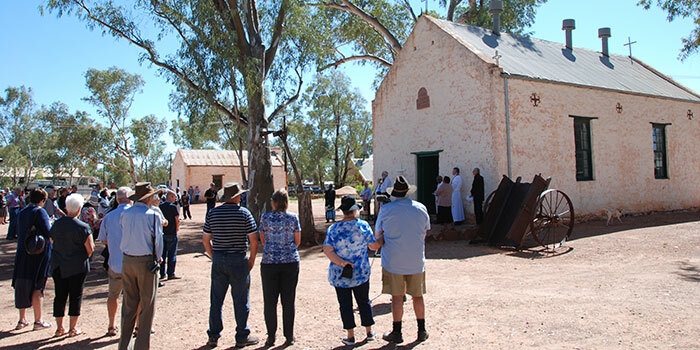 The son of church council member Marion Swift, Nicholas was born 25 years after that foundation stone was laid, and 94 years after the second church was built at Hermannsburg in 1896. His holding of the time capsule, together with Olga and Karl, represented the passing of the baton of faith from one generation to the next. 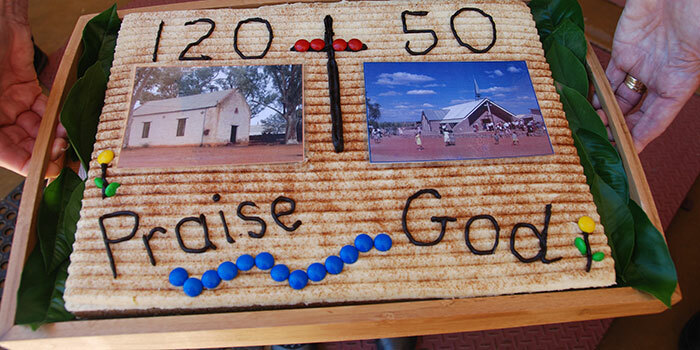 Finke River Mission was established in 1877 by German missionaries who dedicated their lives to introducing the people of Central Australia to Jesus Christ. 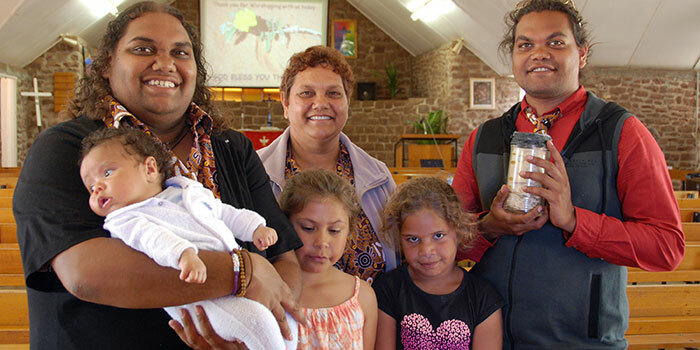 Today there are around 7000 Aboriginal Lutherans in the heart of Australia. Finke River Mission’s ministry among and with the Aboriginal people covers the Arrarnta, Pitjantjatjara, Luritja, Alyawarr and Anmatyerr language areas. 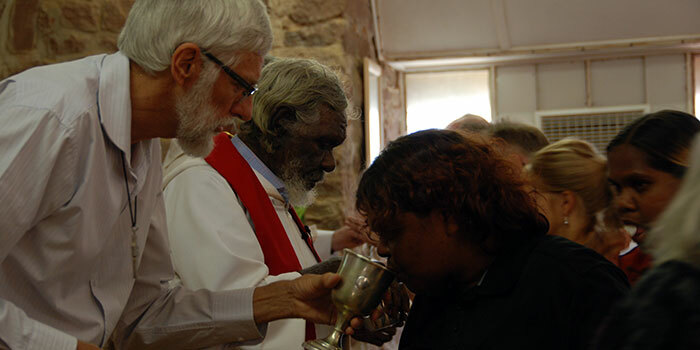 More than 20 Aboriginal Lutheran pastors, all of them multi-lingual, proclaim the gospel of Jesus Christ in more than 40 remote communities in Central Australia. In his role as a lecturer at Australian Lutheran College, Dr Pfeiffer has for several years been leading ‘bush courses’ for the Aboriginal pastors and evangelists in Central Australia, where theology is taught under brilliant blue skies in classrooms of burning red sand, spinifex and bushy mulgas. 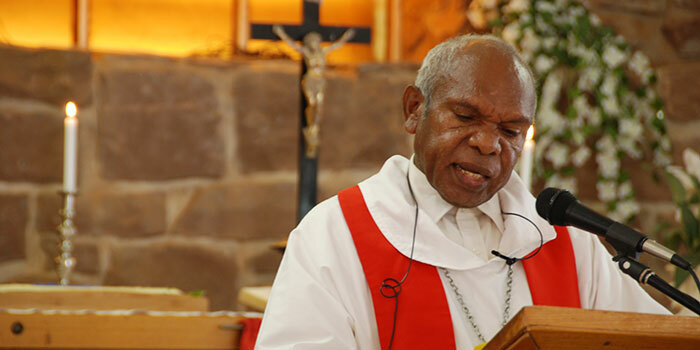 In his sermon Dr Pfeiffer reflected on the long line of faithful people, Aboriginal and non-Aboriginal, who had endured immense hardship in order to bring the gospel and nurture it in a harsh land. Read Dr Pfeiffer’s sermon on the occasion of Bethlehem Lutheran Church’s 50th anniversary.